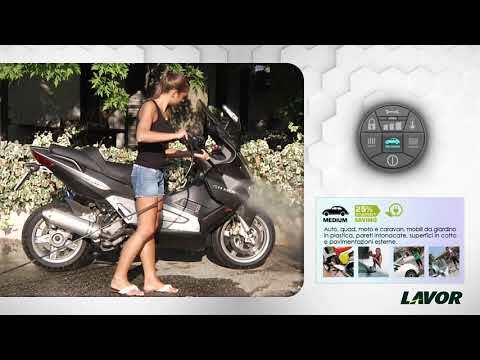 Great news by LAVOR: high-pressure cleaner with digital control, washing programs and safety systems. Thanks to the DIGITAL CONTROL system (patented) it is possible to monitor the main functions of the machine (power indicator, overheating, necessary maintenance, child safety, functioning lights) and to choose the most suitable washing program considering the surface to be washed among SOFT, MEDIUM and HARD with a considerable saving of power consumption. • Three pistons, aluminium pump head with built-in by-pass valve. • Detergent built-in tank.• Hose-reel. • AUTOMATIC STOP SYSTEM • Digital Control System. • Washing Program System WPS • Trolley with ergonomic handle. • Accessory storage facility. • Gun with quick connection. • High pressure nozzle with adjustable jet. • Turbo nozzle • Fixed brush. • Rotary brush.